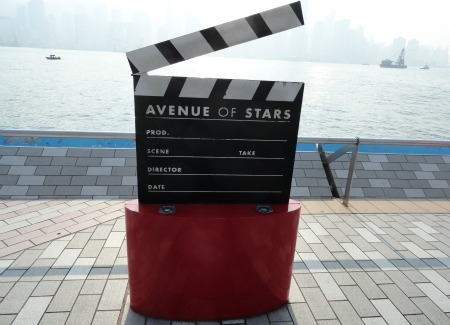 The Avenue of the Stars is a tourist attraction found on the Tsim Sha Tsui Promenade in Kowloon. Along this walkway are plaques that look like large film strips with a giant star on the right side of the plaque. The name of a famous actor/actress in the Hong Kong film industry is written on each star along this promenade. To the left of the star is cement where the actor/actress has put their hand prints and signature. If the famous person was deceased before their name was put on a star in the ground, there are no hand prints, only a star. This walkway is similar to the Walk of Fame in Hollywood, California. The difference being that the names in the stars here are of famous people in the Hong Kong film industry. The entrance is just south of the Salisbury Garden in Tsim Sha Tsui. From here you’ll be greeted by a giant replica of the statue given to the winners of the Hong Kong Film Awards. 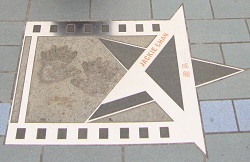 As you walk along the Avenue you’ll see stars in the ground with famous names such as Bruce Lee, Jackie Chan, Jet Li, Chow Yun Fat, John Woo, Stephen Chow and many other celebrities. In total there are 101 stars in the ground. Along the way you can read about the history of the Hong Kong film industry since it started back in the early 1900s. You’ll also see many more statues as you walk down the avenue. 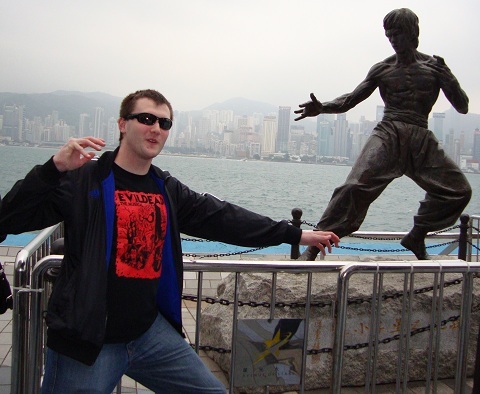 The most popular one being the bronze Bruce Lee statue. 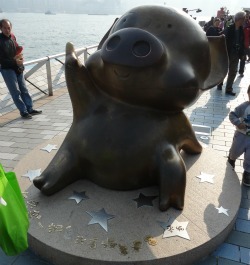 In the summer of 2011 a bronze statue of the popular character Mcdull was added to the Avenue of the Stars. McDull is a popular pig cartoon character created in Hong Kong. You may have seen McDull posters and merchandise while walking around the city. Since the Avenue of the Stars is located on the waterfront of Tsim Sha Tsui, this is the perfect place to visit when you come to see the Victoria Harbour. At night it’s the ideal viewing spot to witness a Symphony of Lights. Getting here is very easy as the East Tsim Sha Tsui MTR Station is only a short walk away. Once you get to the station, just walk south towards the Victoria Harbour.